Woah! The time surely does fly like crazy! It's been already a week since I've arrived to LA! Can you believe it? It's crazy! apartment did seem like an easy task, but it really isn't. that we've been dealing with to find out that they were both "shady"
to know if we're getting this place. hotel room "life" and living out of our suitcases. All of my stuff is divided between 6 bags and I can never find anything. outfit to present you in this post. wearing heavy winter boots every single day. it or not, so tomorrow we'll be visiting Wax and Guiness museums. a little bit and not stress so much about this big move. How are you doing my dear readers? Cute outfit. Love the khaki additions. Check out my new Post on my Blog about Gangsters in Paradise. Cute outfit and I love LA. Thanks for sharing and have an awesome day. what a nice outfit and design or dress which is used bu model and combination of hand bag. Love this look!! You look gorgeous!! Divna suknja…nadam se da ces se uskoro smijestiti negdje lijepo. Such a classic look I love the dress very transitional! Love the print on the skirt. I love this feminine, casual chic look! The skirt is simple beautiful. If so follow back i just followed you. You look so nice.Your skirt is amazing.Great pictures. 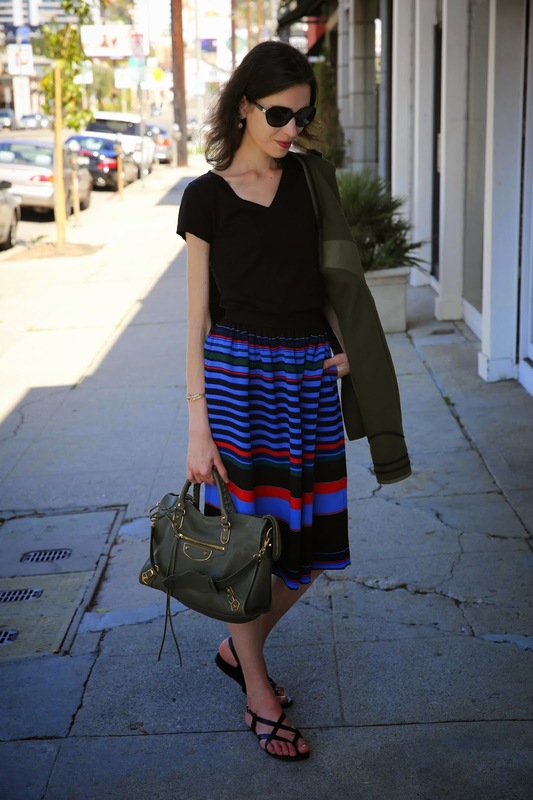 Considering I love anything striped and anything midi, this skirt is pretty much right up my alley! I will be stealing it from you. You've been warned.